Evacuate! Evacuate! Are you ready? This is how pilots start the RTO (rejected take-off) briefing before each and every flight. Most hope to never have to execute this in anger, but it is thoroughly trained during every simulator session. 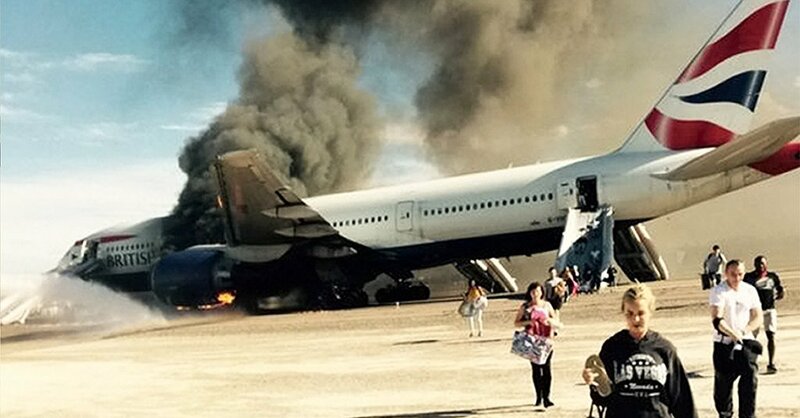 (I have had a few actual RTO’s for technical issues, certainly nothing as dramatic as the severe engine damage suffered by the BA Boeing 777 at Las Vegas yesterday). While the pilots prepare the cockpit, the cabin crew are also going through a thorough briefing, explaining how passengers should act in an emergency. In essence the most frequent fliers you can find thoroughly brief all the potential emergencies every time they fly. Yet passengers, whose lives could depend on these briefings mostly tend to ignore the instructions. Just look around and you’ll see them, burying their noses in newspapers, texting, calling, looking important with their laptops and tablets – completely oblivious to the life saving message directed at them. Yet, when that emergency does happen, these passengers are usually the very people who react incorrectly and potentially endanger the lives of all on board. The recent BA2276 passenger evacuation once again showed us how little regard passengers have for the instructions which could save lives. Bags, trolley cases, you name it – what happened to “leave everything behind”? Why rush? The fact that tons of Jet-A1 could explode seems of no concern.. (Pic: Independent). Part of the problem is that we have positioned air travel as so safe and so reliable that our passengers are simply not ready or prepared to accept that things could actually go wrong. Once they’re settled on board, their next planned action is to disembark at their destination. Any disruption to that programmed thinking will have a startling effect and result in the improper reactions we’ve once again seen in the Las Vegas incident. 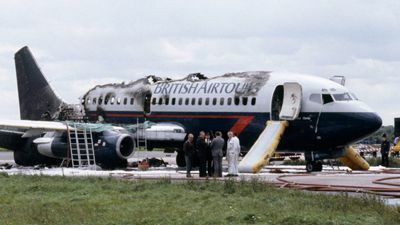 History shows that aircraft fires mostly have catastrophic results – unless the correct procedures are initiated very, very quickly and efficiently. Pilots and cabin crews are trained to execute these life saving procedures which could effectively ensure a safe outcome. Aviation has learnt from previous disasters. British Airtours B732, Manchester, August 1985. 55 out of 130 passengers died. (File pic). Air Canada DC9 at Toronto, June 1983. 23 of 44 passengers killed. (Pic: deicinginnovations.com). Our passengers have not had this intensive training and thus rely on the crew to keep them out of harm’s way. They clearly do not realise that this is a two-way contract: I’ll do my part, but you need to do yours as well! The first required step is to be courteous enough to pay attention to the safety briefing. 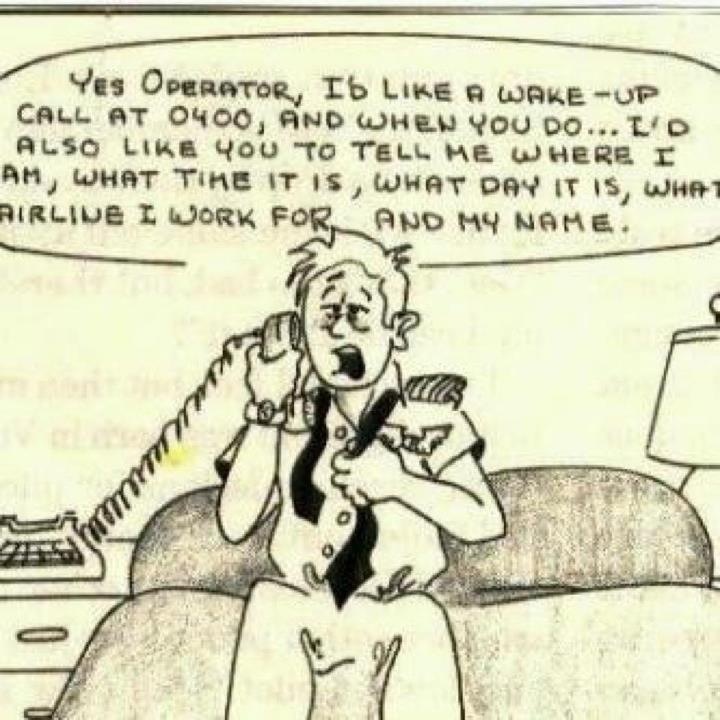 Those last minute calls should have been made before boarding; no spreadsheet is so important that it can’t wait until we’re at cruising altitude; that newspaper is not going anywhere. 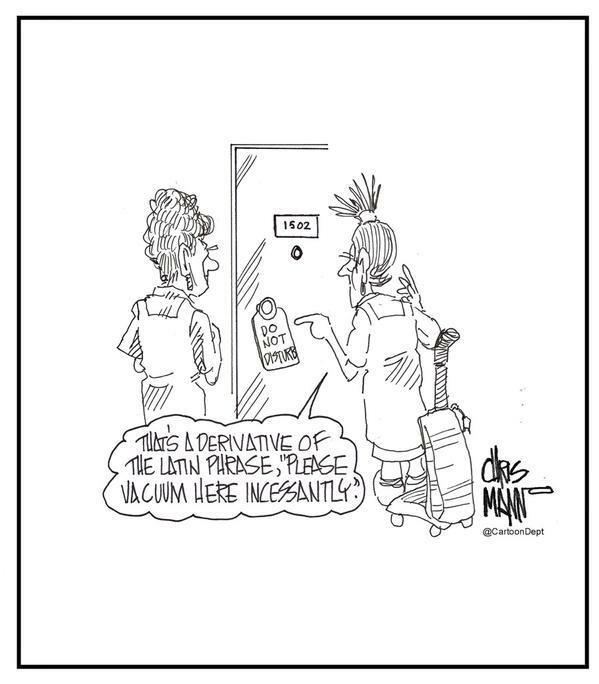 Regular flyers may think that they’ve heard it all and would know how to react, but experience and research has shown that when an evacuation is ordered passengers tend to head straight for the door where they boarded, not the one closest to them, or even the safe exit pointed out by the crew. In yesterday’s BA 2276 evacuation the over-wing exits were not used (for obvious reasons) – but identifying the hazards and blocking certain exits is all part of cabin crew training. 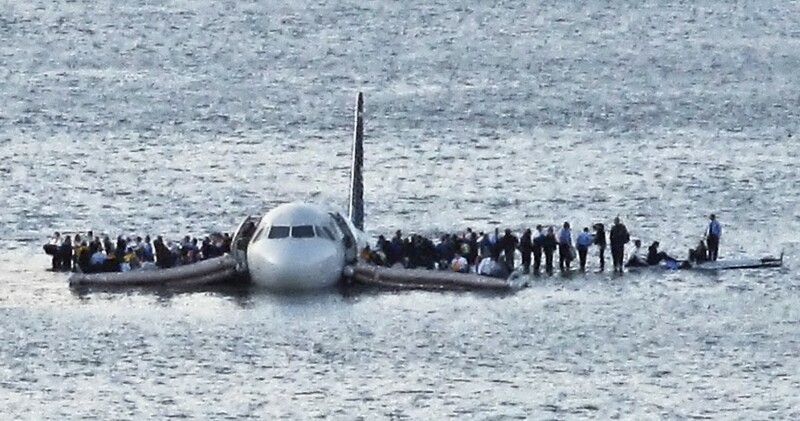 After his landing in the Hudson river, the majority of passengers told Captain Sullenberger “If only we had listened to the safety briefing!” Most of those passengers ended up without their life jackets or did not know how to put them on. Very few passengers have life jackets on. (Pic: Reuters). Human Factors research has shown that in an emergency situation humans will probably follow their last or most recently rehearsed or executed course of action – if that is not the required action, disaster could follow. That is why flight crews brief every phase of flight before they get there – the last rehearsed action. Cabin crew do the same: Before every departure or landing they go through their Silent Review, rehearsing in their mind’s eye their actions in an emergency. When passengers pause for a moment to consider their behaviour on board, they should bear in mind that cabin crew are safety officers who are responsible for passengers’ safety. While time allows they can serve coffee or tea, but that is not their primary function. That primary function is to ensure that all on board stay alive – even should it require screaming and shouting at passengers to shake them out of their momentary confusion, shock and disorientation in an emergency evacuation. 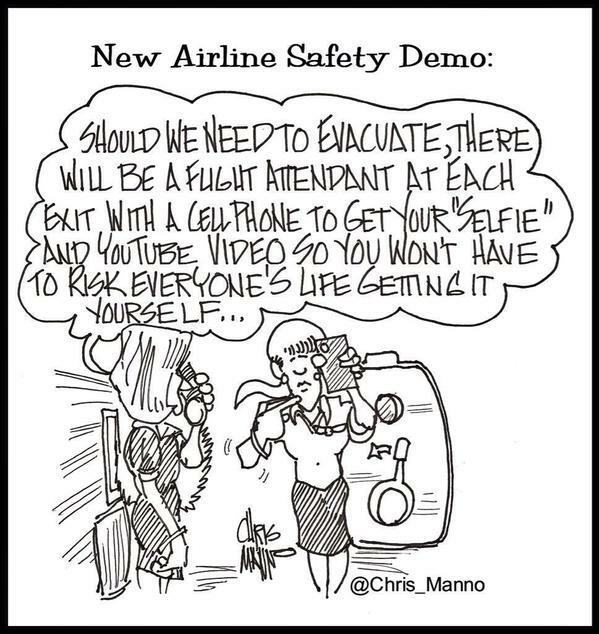 American Airlines Captain Chris Manno’s take on irrational passenger behaviour. Firstly – have the good manners to pay attention to the safety briefing. Secondly – have your important ID documents on your person. Finally – leave everything else behind when ordered to evacuate – those things can be replaced, your life cannot. Crew members should remember why we are there: To safely and comfortably transport passengers to where they want to be. Should delays or emergencies make that impossible, the crew’s duty is to ensure that everyone survives with minimum injury or discomfort. And don’t worry, someone else will post the pictures on the internet even before the emergency vehicles get there – so you’ll get to see it later!